WEST WINDSOR – The Mercer County Symphonic Band will presents its 2016 Spring Concert on Wednesday, May 25, at 7:30 p.m. at Kelsey Theater, on the West Windsor campus of Mercer County Community College (MCCC). Admission is free. The program includes themes from movies featuring heroes, including music from Superman, Indiana Jones, James Bond and Star Wars. The band will also perform selections from the ballet Appalachian Spring by Aaron Copland, swing band era music by Irving Berlin and George Gershwin, traditional American marches, and more. 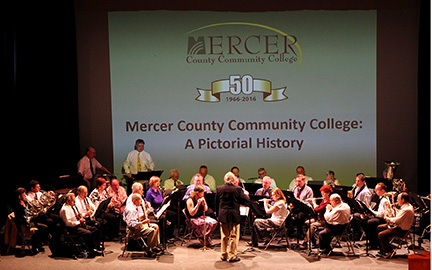 The Mercer County Symphonic Band during a performance in April at the inauguration of Dr. Jianping Wang, the sixth president of Mercer County Community College. Under the direction of Dr. Lou Woodruff, the Mercer County Symphonic Band is celebrating its 35th season with 60 participating musicians, spanning seven decades in age. The band is open to all interested musicians without audition and rehearses Monday evenings at 7:30 p.m. September through June, in the Music Suite (CM156) on MCCC's West Windsor campus, 1200 Old Trenton Road. The Mercer County Symphonic Band is supported by the Arts and Communication Division of MCCC, with funding from the Mercer County Cultural and Heritage Commission through a grant from the New Jersey State Council on the Arts. Visit the band’s website at www.mercerband.org.